Selecting your first piece of bespoke jewellery is a thrilling and memorable experience. To make the process as streamlined as possible and help you find a piece you’ll treasure forever, there’s a few key considerations to keep in mind. One of the most important factors when it comes to selecting a your first piece of bespoke jewellery is to conduct thorough research on the different types of gems, so that you can identify what best suits your needs. If you are seeking a certain colour, often there are a few different gems that may be available in the colour you desire. While various gems may come in the same colour, their exact hue will be different depending on the stone, so make sure to keep your options open and explore a wide variety of gems. For those seeking a bright, colourful piece, our Aquamarine and Diamond Halo Ring is a stunning choice. The tranquil blue hue of this bespoke ring is absolutely mesmerising and exudes timeless beauty. It is also very important to choose a jeweller who will spend time with you to help you choose your dream piece. Here at the boutique, we organise personal consultations for each of our customers to ensure they are able to attain a piece of jewellery that will bring them joy for countless years. Along with this, it is vital to consider the purpose of the piece you are seeking. Do you want a subtle sophisticated piece for everyday wear or perhaps you desire something eye-catching and dramatic for special occasions and formal events? 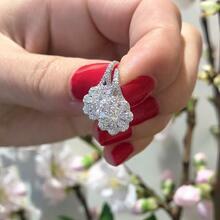 One of our favourite pieces for showcasing elegance and classic charm is our Diamond Flower Drop Earrings. These gorgeous earrings catch the light in the most spectacular way and are perfect for starting your collection of bespoke jewellery. With the help of these tips you’ll be well on your way to finding the ideal piece of bespoke jewellery in no time! To get started on your journey towards attaining a beautiful piece of bespoke jewellery, make an appointment with one of our experts at the boutique.